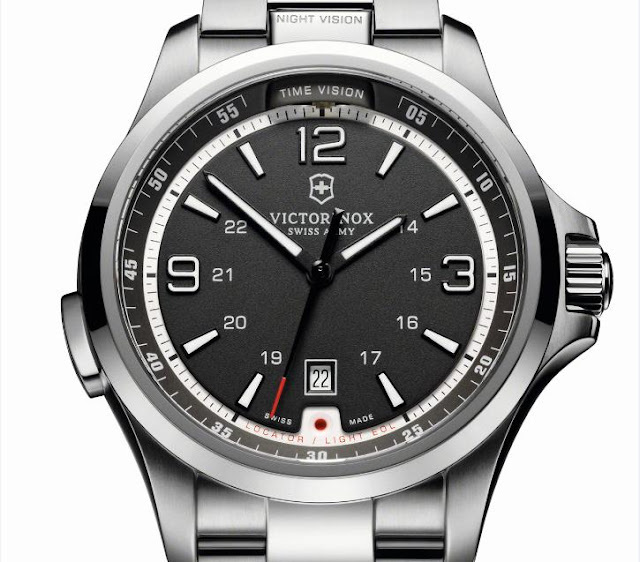 As the Victorinox Night Vision has been around since 2003, there are quite a number of versions out there lighting up the dark, but the 2012 version is perhaps the sleekest and most civilised yet. In fact, the new Night Vision has undergone its biggest transformation since its launch, and, true to the original, this new version comes packed with functions. 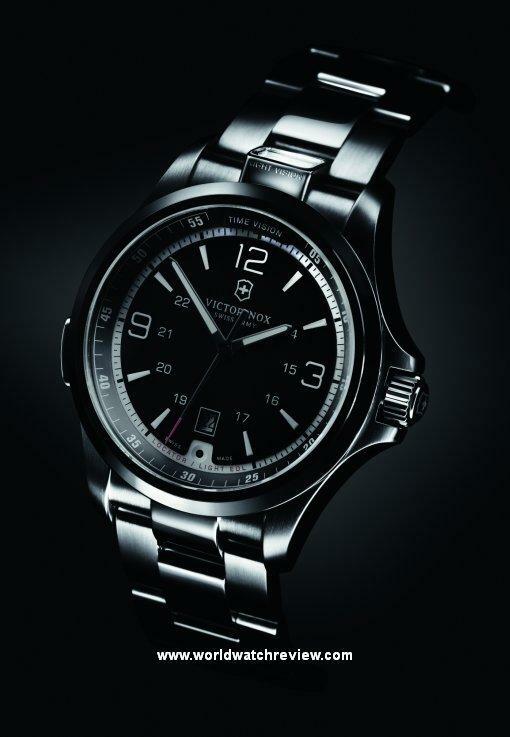 Energy-saving LED technology provides dial illumination, flashlight and emergency strobe function, all are seamlessly incorporated into a classic Swiss watch design. 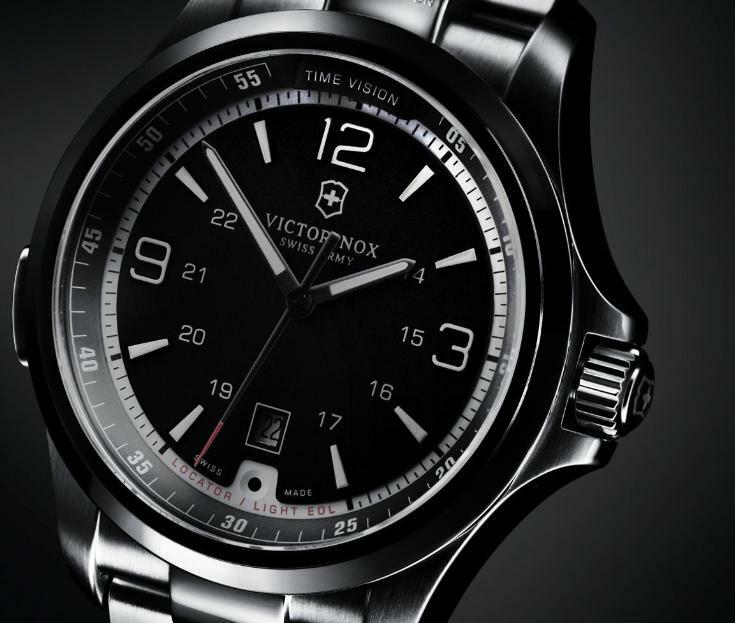 The dial is in anthracite grey or silver-toned versions, on a steel bracelet or on an aviator-style brown leather strap. The Night Vision version 2012 cleverly combines discretion with plenty of functionality. Traditional codes are respected with no show-off gadgetry. The timepiece’s pioneering lighting features are seamlessly incorporated into the sleek dial and bracelet design and the watch runs on the same ultra reliable Ronda Quartz 705 movement. With a 42mm case, the new edition builds upon the original’s exclusive design features — the integration in a watch of low consumption LED light modules for dial illumination, flashlight and strobe functions. But for 2012, the look is more streamlined. Three dial versions are available: charcoal grey dial with silver ring and steel bracelet; silver dial with dark grey ring and steel bracelet; and silver dial with dark grey ring and brown ‘aviator’ leather strap with beige stitching and buckle. The watch also has a dial illumination system, with its hands, hour markers and three prominent Arabic numerals covered with lume allowing for easy you time checking during the night without wasting the battery. Water resistant to 50 metres, the new Night Vision is a dynamic new upgrade for this popular model and it will be available in the Fall, so not long to wait.